Jake Parenteau had just finished a morning pre-skate when University of Minnesota head coach Don Lucia called him into the coaches' room. “Coach told me I was getting the nod,” Parenteau said. “First thing I did was call my mom and she just started screaming. Parenteau suited up for his first game as a Golden Gopher on Sunday, Oct. 24, against St. Cloud State. 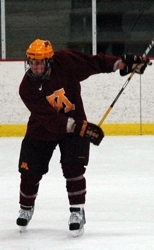 The Gophers won 2-1 and even though Parenteau did not register a point, he was the MVP in the eyes of a few attendees. It took time and hard work to get to the WCHA. Parenteau was also working against the odds as Chisago Lakes had produced only one Division I hockey player (Chad Anderson of the University of Alaska-Anchorage) in the last 10 years. Not many skaters from the Minnesota Junior Hockey League, a Tier III junior league and Parenteau's first post high school destination, survive the long road to the DI level. 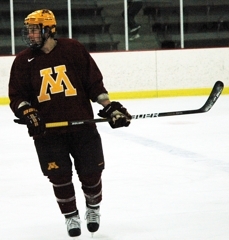 Yet despite the odds, Jake Parenteau is a Gopher. For most students graduating high school, the next step is college. For Parenteau, the next step was different. Parenteau graduated in 2007 from Chisago Lakes High School and immediately set his sights on hockey. The next stop for the talented defenseman was the St. Paul Lakers of the MJHL. “There were certainly a few coaches in the MJHL that were interested in Jake. I believed he could play at a higher caliber than that,” Chisago Lakes coach Corey McKinnon said. “One thing working against him was coming from a smaller school. “The one thing from a high school coach's standpoint, I try to sell all the guys I can to play at the next level. You know what guys have it inside them based on what they bring to the rink every day here in high school. Jake's 'happy-go-lucky' attitude made it a really easy sell." Parenteau registered 37 points for the Lakers during the 2007-2008 season and won the team’s Rookie of the Year award. The successful season opened the door to more opportunities. The North American Hockey League (NAHL) would end up becoming a crucial part of Parenteau’s development. However, the location of his NAHL career had yet to be determined. Boitz had previously coached the Outlaws but had taken over the head coaching duties for the Alaska Avalanche in the NAHL. “I thought, ‘Who wouldn't want to play there?’ So I decided 'Heck yeah, I'll go.' The first year was really fun and went really well,” Parenteau said. Parenteau made an immediate impact. He led the league in goals by a defenseman and helped the Avalanche to their first playoff appearance. Despite all the positives -- including finishing the season with 21 points -- Parenteau wanted more. Although Parenteau had natural ability, he was open to all the help he could receive. Parenteau's training paid off as he not only led the league again in goals by a defenseman, but also points by a defenseman with 47 (16 goals, 31 assists). The Avalanche also made their second consecutive playoff appearance. Parenteau’s 68 career points with the Avalanche made him the highest scoring defenseman in franchise history. A successful NAHL career drew the attention of several prominent colleges. 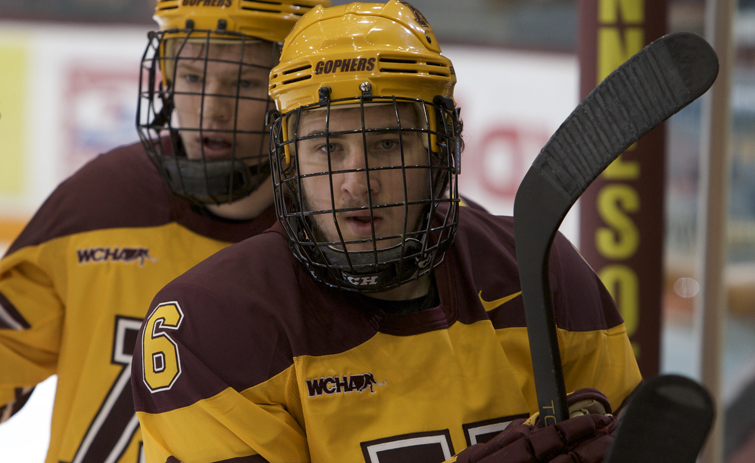 “Minnesota was the biggest college talking to me,” Parenteau said. “St. Cloud State also had interest in me and some East Coast schools did too. It was either the University of Minnesota or St. Cloud State. 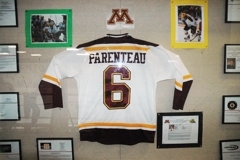 Gopher maroon and gold already ran through Parenteau’s veins long before he made his choice. That gear was likely inspired by his father, Tom, and his uncle, Mike Anderson, both of whom played for the Gophers in the early 1980s after graduating from North St. Paul. Parenteau has played in four games this season for the Gophers; an experience he has cherished. So far, he has registed five shots and four blocks. That excitement stays with him even when he’s not on the ice. “I can't sit still on the bench,” Parenteau said. “When I'm not on the ice I'm shaking with excitement and adrenaline. I'm excited to go out there and do my job. At 21-years-old, Parenteau is not the typical age for a freshman. Fellow Gophers’ freshmen include Mr. Hockey award winner Nick Bjugstad (Blaine) as well as Max Gardiner (Minnetonka); both are 18. Regardless of age difference, Parenteau has a lot of respect for all his teammates. “(The upperclassmen) have been here longer,” Parenteau said. “They've been through it for three years already. I've played four games and I'm still a freshman. You can be older but you still have to respect them. Parenteau is hoping his playing time will increase through hard work and by putting in some extra effort. 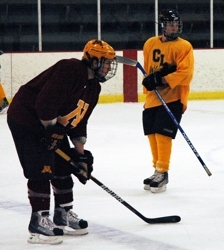 His work ethic included spending time skating with former teammates during his holiday break at Chisago Lakes Ice Arena. “Having him at practice brings two elements,” McKinnon said. “The first is that 'Gopher' element on the ice. 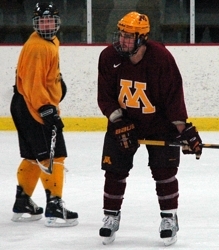 It's not too often kids come out of Bantams and take shifts with a Gopher at practice - I think that's pretty cool. “The other thing is that it's just Jake Parenteau. He's that Chisago kid and he's got that humility about him. It doesn't matter who's skating with him. Whether he's skating with a kid who's just barely made our JV or he's skating with our best athletes - Jake's going to work with them, help them out, have a smile on his face and mess around a little bit. Parenteau has made an obvious impact on the Chisago Lakes community as his No. 6 Gophers' sweater is on display at the Chisago Lakes Ice Arena in honor of his longshot success story. Additionally, the Chisago Lakes Hockey Association will be awarding the 'Jake Parenteau Character Award' each season to a to a Chisago Lakes high school player. The criteria for the award is to be similar to the Hobey Baker Award which is defined on the Hobey Baker Memorial Award website as: candidates must exhibit strength of character both on and off the ice; candidates must contribute to the integrity of the team and display outstanding skills in all phases of the game; and consideration should be given to scholastic achievement and sportmanship. Parenteau knows he'll have to keep working to continue to make those good things happen. “I have to work on everything. Every second of practice, I’m skating as hard as I can and acting like it's a game situation. Sooner or later it will pay off hopefully. You gotta earn your spot and that's how it is. Five story lines for the upcoming boys' hockey season. Nick Swaney of Lakeville South wants to be a player like those he aspired to be.